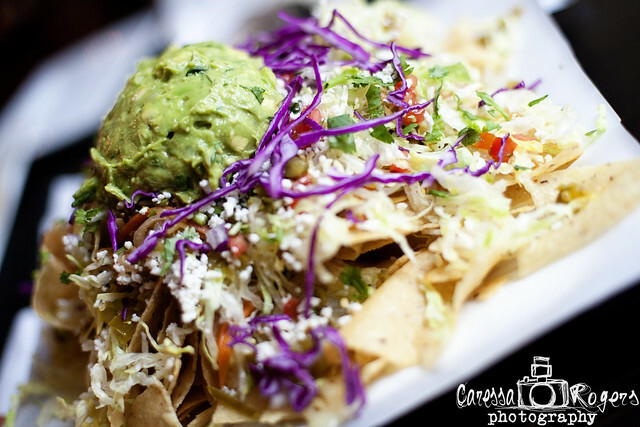 Caressa Rogers Photography: Nachos worth "flying" for! Meet the most amazing nachos ever! On a recent photography trip to Texas two of my clients suggested we stop so I could try their new favorite place, Yucatan Taco Stand. I am forever grateful to them... well, except for the fact they introduced me to my new favorite food that is miles away in Texas. :( They are so good I'd be tempted to hop on a plane just to get them! For $8 you get this huge plate of nachos, covered in a garlic aioli sauce, a queso sauce, shredded veggies, cilantro, cabbage, queso fresco, and a huge serving of guacamole. Oh and to top it off... there is this sweet and spicy sauce at every table! If you are ever in the Fort Worth area you must visit, Yucatan Taco Stand! The two fabulous girls, Cooky & Sam, who introduced me to my new favorite food!